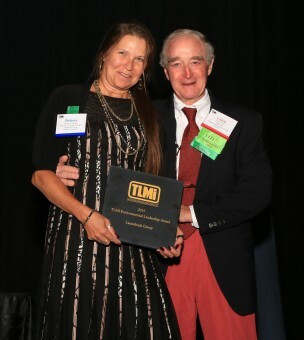 Calvin Frost presents Dolores Corcoran of the Lauterbach Group with the TLMI Environmental Leadership Award. 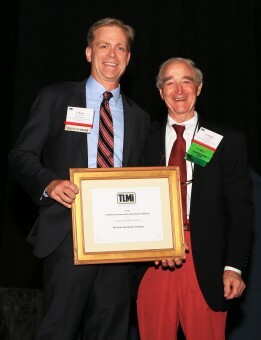 At the recent TLMI Annual Meeting held in Colorado Springs, Colorado, the Lauterbach Group, based in Sussex, Wisconsin, received the TLMI Environmental Leadership Award. Yerecic Label of New Kensington, Pennsylvania and Midland, Michigan-based Dow Chemical were additionally recognized for their notable achievements in demonstrating a commitment to TLMI’s sustainability initiatives for waste reduction, tangible and replicable practices, and unique sustainability initiatives. The TLMI Environmental Leadership Award recognizes a TLMI member that has consistently demonstrated a commitment to progressive environmental practices across a range of areas including solid waste reduction, recycling, waste or energy recovery, the implementation of new ‘clean’ technology and/or processes, and the implementation of an education program. Calvin Frost presents Art Yerecic of Yerecic Label with a special sustainability recognition from TLMI. During the last several years, Lauterbach has focused on health and wellness throughout its organization; focused on education, job training and career development; and monitored purchases with recycled content, renewable energy and green technologies. The company has also reduced water and energy consumption with documented and measurable tracking, in addition to waste and plate spoilage. A TLMI L.I.F.E. certified member, Lauterbach’s operation and culture embrace the highest level of environmental stewardship. Dow Chemical received special recognition for the company’s Sustainability Initiative program, driving awareness and environmental education across the supply chain. Dow uses its expertise to leverage relationships that enabled the company to launch a “recycle-to-feedstock” project. The project closes the loop on non-recyclable substrates by creating high-value synthetic oil from these materials. Yerecic Label received special recognition for the company’s continued dedication to expanding TLMI’s message regarding sustainability and for its own exemplary sustainability practices. Members of Yerecic Label continue to be active in TLMI, including the chairmanship of the TLMI Recycling Solutions subcommittee. 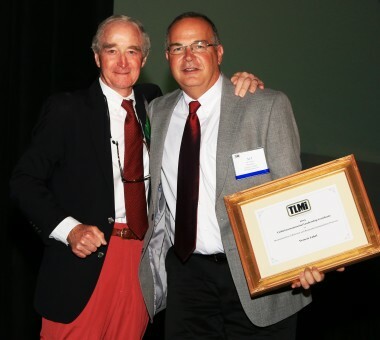 Calvin Frost presents Chris Urheim of Dow Chemical with a special sustainability recognition from TLMI. Yerecic Label has measured its in-house waste stream and has developed an energy application as an alternative to landfilling. Since the inception of its program, the company has diverted more than 2,000 tons from landfills.